Mission Statement: To promote the art and science of medicine and the betterment of human health by publishing manuscripts of interest and relevance to internists practicing as generalists or as medical subspecialists. The JAMA Network is a consortium of peer-reviewed print and online medical publications that includes JAMA, JAMA Internal Medicine, and other specialty journals. 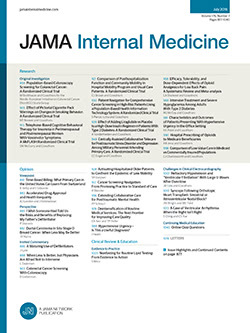 JAMA Internal Medicine does not hold itself responsible for statements made by any contributor. All articles published, including opinion articles, represent the view of the authors and do not reflect the policy of the Journal, the American Medical Association, or the institution with which the author is affiliated, unless otherwise indicated. © 2017 American Medical Association. All rights reserved. Reproduction without permission is prohibited.